TheCyberClub the brainchild of Professor Richard Benham one of the World’s foremost Cyber and Digital Experts and Angela Edwards a leading figure in the business community. 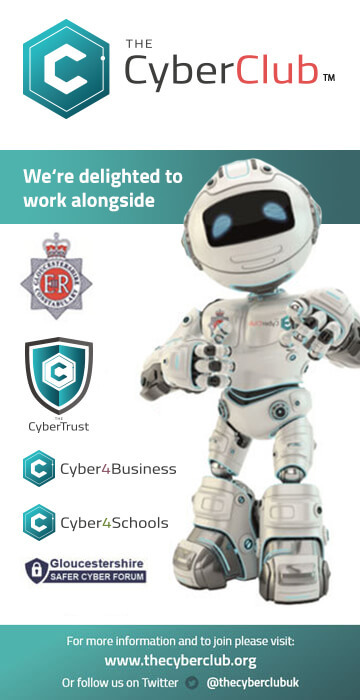 Extensive research and feedback from the business community combined with the support of Gloucestershire Police Constabulary have all attributed to the formation of TheCyberClub. TheCyberClub is a place where members can stay in-touch with the latest cyber news, receive regular updates, be informed of breaches and alerts, understand the threat landscape, keep up to date with the latest products and services to the market. A trusted place to keep your business safe. Join Today for just £59.00 + vat per month you can access FREE training for your staff, GDPR Workshops, Thought Leadership and World Class Guests Speakers. Direct Access to Professor Benham the Digital Champion for the South West Region and UK Expert, Access to preferential rates on products and services and more. Join today and get your Life Size Cyber Citizen delivered to your door! TheCyberClub The Trusted Place To Keep You Up To Date!